Gamble eventually accumulated almost 3,500 acres and was producing large amounts of sugar. It was transported on the river to New Orleans. It is said he held more than 200 slaves to work the property and process the sugarcane. The Manatee River made it possible to get machinery and manufactured goods by ship from places like New York and England. The ships also brought cigars, coffee, tea, twine, needles, leather, rope and seeds. The planters shipped their commodity crops downriver and across the Gulf of Mexico to the international port. In 1849, the first sugar works were destroyed by a fire, along with Gamble’s first sugar crop. The new mill houses were built using fire resistant tabby clay and brick, molded by hand by slaves. Water was a precious resource, so Gamble had a covered, 40,000-gallon cistern built on the west side of the home to collect rainwater from the roof. A wood-shake roof led to the water to a 50-foot deep reserve, providing the household with fresh water. “They burned oyster shells to create a limestone wall and that was used to filter the water,” Toney said. “Minnows were also added to eat the mosquitoes and the algae, helping to further filter it and make it consumable.” Gamble also grew cotton to be used for bedding and clothing, and tobacco for his own enjoyment. A hurricane hit in 1856 and destroyed some of the crop. Another crop was destroyed when the temperature dropped to 27 degrees, freezing the plants. 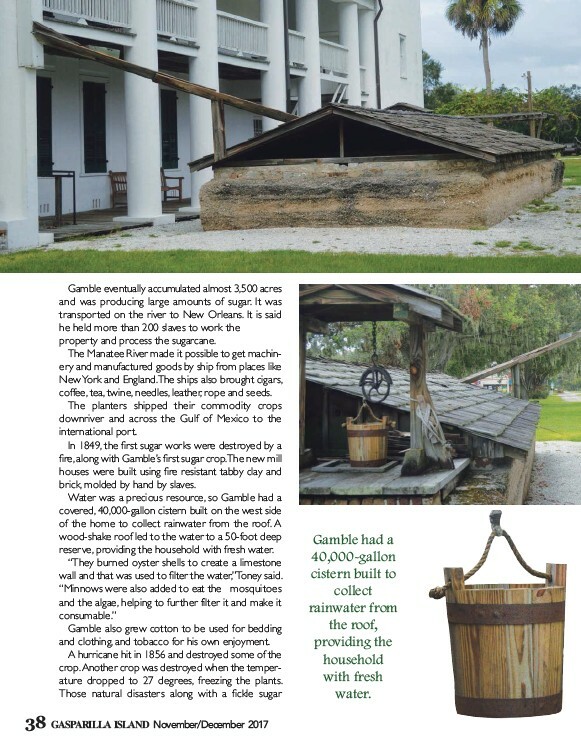 Those natural disasters along with a fickle sugar 38 GASPARILLA ISLAND November/December 2017 Gamble had a 40,000-gallon cistern built to collect rainwater from the roof, providing the household with fresh water.